There are a huge range available to buy now but do you know why it’s a good idea to understand the importance of what to look for. How many of these points do you know? 1. 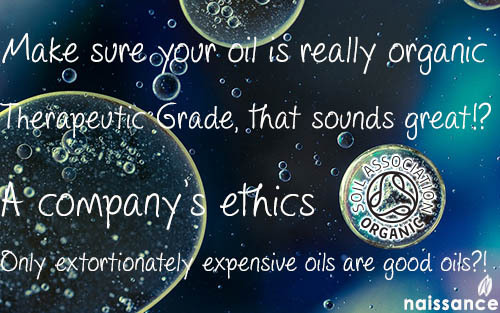 Making sure your oil is really organic. The Soil Association logo verifies that organic products have been checked by the Soil Association and are genuinely organic. To maintain our organic certification, we have to abide by the strict rules of the Soil Association and UK and EU legislation. As a company we must also keep accurate records regarding the products and where we source our ingredients. 2.Therapeutic Grade, that sounds great!? Someone clever somewhere made up this name so we’d think their oils had some kind of medicinal seal of approval. It sounds good but it’s not verified by anyone but the companies that make them. Naissance supply 100% pure essential and carrier oils, which means they are not diluted with anything else. Our essential oils are beneficial (therapeutic you might say) when they are used in the right way and you find the oil that is right for you. We do supply some combination oils for those who want pre-mixed oils. We supply a full range of excellent quality oils from around the world. 3.Only extortionately expensive oils are good oils?! As a small company we can provide excellent products at fair prices because we don’t spend lots of money on packaging or marketing or advertising or affiliates. We would rather provide more products, so more of you can enjoy them and benefit from them, than provide less products which lots of you cannot afford. Which is one of the reasons we price our products fairly. We like people and we want to build good relationships with everyone we work with. What is life, after all, without lovely people. Like our Aloe Vera farmer here. Naissance was started as, and still is, a family run business. We sell oils that we also use at home, we source the finest quality ingredients, use minimal packaging and are always striving to make great products that don’t cost the earth. We believe in reducing, reusing and recycling and are doing everything we can to keep our waste to a minimum and package our products with the health of the environment in mind. We pay our taxes, don't offshore any money and pay every full-time, permanent member of staff the living wage. We don't test on animals except for the humans that work here :), and everything but our beeswax is vegan friendly. Have you found it difficult finding organic food oils? We’d love to know about your experience. Coming up Tomorrow …… Why it’s Time you Considered Feeding Your Kids Organic Food – You love your children don’t you, so this may have been something you have been thinking about for some time. Now the evidence is here about how it will help your child’s development. Can you afford not to give your kids organic food?